For many years Commercial Lending was guided by the saying “I used to walk into the Bank and on a handshake would borrow money today and come back and sign documents tomorrow.” That world changed in the late 1980’s and early 1990’s as banking regulators and regulations became more strict, forcing would be borrowers to actually provide some documentation and support for what they wanted to borrow, and then come back and sign documents later after the loan was more formally approved. Even with the stricter regulations starting in the late 1980’s, borrowing money was still relatively easy. Then shortly after September 11th, 2001 when loose monetary policy flushed the banking and lending system with capital, walking into a bank and getting a Commercial Loan became just as easy as walking into the ice-cream store and getting an ice cream cone; everyone could do it. Although the documentation requirements of the 1980’s and 1990’s still existed, with plenty of capital for the banks to deploy, they were eager to find borrowers to deploy it to. With more banks and lenders in the market than ever before, competition for loans heated up. In order to better meet the demand to deploy capital and churn profits, more lending power was delivered to local managers and lenders (whose incentives were often based on making loans), credit standards were loosened, and approval processes streamlined, allowing higher-risk loans more ability to slide through the system. The rash of higher risk loans coupled with ever increasing real estate values led to a market filled with over-leveraged & under-collateralized loans that when coupled with cash-strapped borrowers created a bubble that when it popped spelled doom for many financial institutions. It was the popping of that bubble that changed the face of Commercial Lending not only in our life times, but potentially forever. The change started with a constriction of capital going into lending, which then led to a severe shortfall in available capital to fund existing and new deals. Without capital to fund loans, more deals went bad, and the Banks started to loose money, and eventually many lending institutions failed; and some are still failing. This led to a further constriction of capacity in the system. As Banks started to struggle, additional pressure was placed on the industry by regulators who demanded better reporting and increased capital requirements from the financial institutions they regulated, causing those institutions capable of lending money to rethink how they were going to lend money. And finally Congress got involved and passed new regulations increasing the required capital ratios for financial institutions, and putting into place strong new regulations regarding pricing, income, and requirements on everything from deposits, loans, credit cards and investments, greatly diminishing the profitability in banking and finance. All of these changes culminated in taking the lending market from one of the hottest growth markets in the first decade of the 21st Century to one of the most despised and least profitable markets, and did so at a time when demand for loans was still high and market share still plentiful. Unless sweeping reverse reforms come from Congress or substantial additional investment comes into the lending markets from new Banks or outside sources (which has become harder based on lessening profits due to new regulations), the face of lending has changed most likely forever. Banks are operating under new rules, and the risk / reward model has become much more about low risk / low reward. 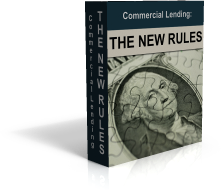 If you own a business or a piece of commercial real estate, you have to learn all the new rules in order to get a Commercial Loan in today’s market. This book is here to serve as a guideline to help you garner the knowledge needed to understand the lending market so you know what to expect, understand why lenders react the way they do to your loan request, and so you can position your request in the best possible way to get done. There is only so much capital available to fund loans these days, so if you do not position your request above the rest, then you might end up losing out on your business and your dreams. This book will give you all of the tools and background you need to successfully navigate the lending system and find the solutions that fit your needs.